A belfry is a typically Flemish edifice and symbolizes the wealth and independence of a town. Shortly after its foundation, Sluis already attained great prosperity and soon plans were made to build a stately hall with an adjoining belfry tower. It's noteworthly that Sluis has the only belfry in the whole of the Netherlands; it shouldn't be a surprise that this graceful tower has become the symbol of the town. Another remarkable curiosity: did you know that the most well-known inhabitant of Sluis lives in the tower? He is called "Jantje van Sluis". His story goes back to the 80 years war and has been immortalized by a statue that you can see in one of the windows of the tower. 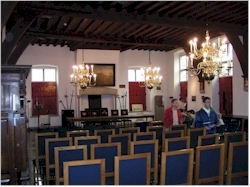 The construction of the present town hall started in 1386, replacing an older house of magistrates. Several clocks and bells were hung in the tower including an emergency clock that was used in case of an emergency. The town hall was expanded in 1420 giving the town an edifice worthy of hosting powerful dignitaries such as the Dukes of Burgundy and English kings. Philip the Good and Isabella had their wedding here (1430) and Charles the Bold had his engagement with Margareth of York in Sluis (1468). The building suffered a lot from a siege in 1604 by Prince Maurits of Nassau and French artillery attacks in 1794. Late 1944 it was completely reduced to rubble due to an allied bombing raid on the town, destroying many art treasures and archives. After the war, the town hall and the belfry were rebuilt according to the original plan. There is also a carillon in the tower that is regularly spreading its music over the town. Both tower and town hall can be visited. From the top of the tower you have a great view on the surrounding flatlands. When the weather permits it, you can see Bruges and the sea in the distance. This requires a bit of climbing on a small winding staircase but the view is worth the effort. A museum has been established inside the town hall itself and you can also find the VVV (Tourist Office) here. 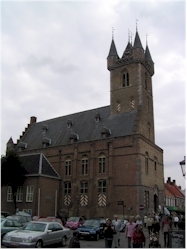 Picture 1: The town hall with the adjacent belfry tower seen from the Market square of Sluis.